My client for this cake was having a backyard bar-b-cue engagement party. She didn’t really have any specific ideas for the cake, but knew she wanted something more casual. The only specifics that she gave me were that the general colors were green and white. I came up with two different designs for her. One was a more polished green and white “fondanted” three tiered cake. The other was a more natural sunflower and raffia cake. She immediately decided that the latter would complement the feel of her party much better. I made a three tiered cake that I frosted in a simple buttercream. 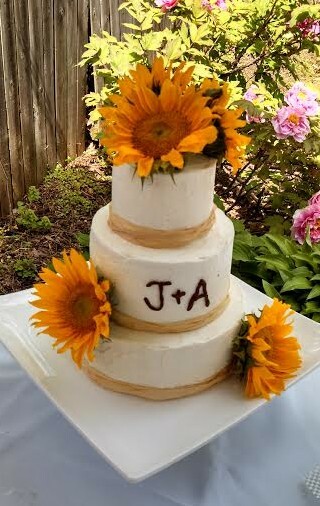 I then added raffia borders on the bottom of the cake and finished it off with fresh sunflowers. This design works very well for any outside event including summer, birthday, or engagement party. This cake can also be dressed up using “fancier” flowers and ribbon, although the simple buttercream icing as opposed to fondant will always give it a slightly more casual look.